Our Patented 2-In-1 Removable Wheel and Handle System has been acknowledged for it’s innovation in design. 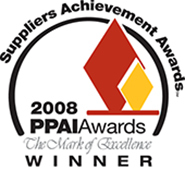 McKlein Company received this award in 2006 and 2008 for our Patented 2-in-1 Removal Wheel and Handle System. Mcklein Company recieved this award in 2009 for our Patented 2-in-1 Removal Wheel and Handle System. 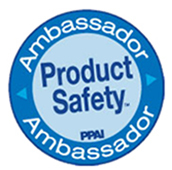 McKlein Company is among the first to achieve ‘Product Safety Award’ status in the Promotional Products Association International (PPAI) Product Safety Awareness Program. This means McKlein Company has met or exceeded the PPAI product safety training and education requirements. The Sage Rating Award celebrates suppliers who provide excellent service and products. Suppliers received this rating through the reviews of Distributor customers who have reviewed McKlein Company’s services and products. McKlein Company received this award in 2019, 2016, 2011, 2010.